The likes of players such as Carey Price are never seriously considered viable trade bait come the yearly NHL trade deadline, or at any other time of the year for that matter. 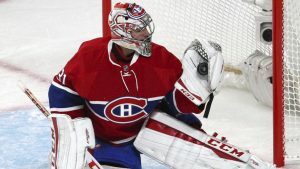 However, the longtime Montreal Canadiens goaltender and stalwart as one of the world’s best could make a difference and be the final piece for a cup contender. And given the current situation in Montreal, it might be best for both the Habs and himself if he were moved now. With tomorrow’s trade deadline looming, things are heating up, with notable players like Rick Nash and Montreal’s very own Tomas Plekanec being moved thus far. Other players, such as the Buffalo Sabres’ Evander Kane and the Ottawa Senators’ all-star defenseman Erik Karlsson, are rumored to be moved come tomorrow as well. What then, is keeping Carey Price’s name out of the conversation? Here’s the case: the Montreal Canadiens are a bad team. Trading a player like Plekanec shows that GM Marc Bergevin recognizes this, at least to some extent. Price is a player he would hope to never have to move, but as of right now, they are in a unique position. They sit at 23-29-9, with 55 points. That’s 3rd-worst in the Atlantic Division, only 8 points ahead of the Buffalo Sabres. Although the Habs have been competitive in recent years, it looks as though their weaknesses are showing and they are not going to be competing for the Stanley Cup any time soon. Montreal’s situation is unique because they are a bad team with high expectations internally, and without the resources to meet those expectations. Their prospect pool is considerably shallow, with most of their promising young talent already on the roster, playing out the season to gain some experience with the big club. And so the situation is this: They are not going to be good for the next few seasons, and are likely going to have to rebuild their core to field a good hockey team in the future. 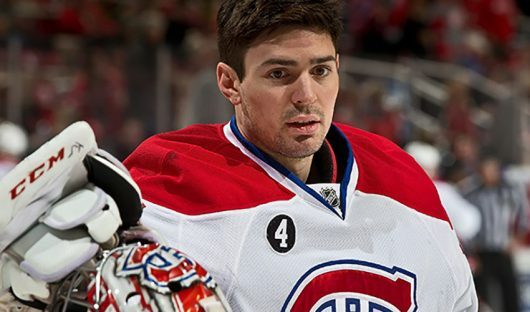 So, why not start with moving the best player on their roster, Carey Price? 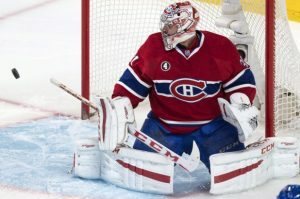 For more than a number of years now, Price has been considered one of the best goaltenders in the world. He has more than a few accolades and accomplishments in his career, including a record-setting season in 2014-15 in which he played 66 games, going 44-16-6, posting a remarkable 1.96 GAA and .933 SV% along with 9 shutouts. For that season, he earned the Vezina Trophy for the league’s best goalie, as well as the Ted Lindsay Award, the William M. Jennings Trophy (shared with Blackhawks goaltender Corey Crawford) and the Hart Memorial Trophy. Price is the first goalie since Dominik Hasek in 1998 to win more than 3 awards in a season. Also to boot, Price has an Olympic Gold medal from Sochi in 2014. Price has accomplished more than any goaltender could ever dream of. However, the bottom line is, he has not won a Stanley Cup. And considering their situation, he is not going to win one in Montreal. The 30-year old elite goalie is about to enter his prime playing years and realistically has a 4-year window with a perennial contender to capture the elusive Stanley Cup. For himself, as well as for the Canadiens organization, now is the perfect time to ship him off somewhere where he can help win a Cup. Price has not been good this season. In 43 GP, he is 15-22-6, with a 2.98 GAA and .904 SV%, with just 1 shutout. Granted, the Habs have been a mess in more areas than one, but Price has not been nearly as good as he has been in years past. If he stays in Montreal, he has the potential to repeat this subpar season and regress even further. One bad season is not going to change the league’s view of him, but two might. The return for him now would be astronomical, but a season from now, it might not. Montreal can get a once-in-a-lifetime return for trading Price, but they can only get that now. If he continues to play with them next year and they bottom out once again, his trade value will go down more than just a little bit. They are presented with a special opportunity: trade the world’s best goalie while he’s in his prime, in the name of their future. Opportunities like this don’t come that often and aren’t always a sure thing, but if Bergevin plays his cards right, he could pull the trigger on this and pave the way for the Habs to contend in the future.